London is a melting pot of cultures with a fascinating range of people and places spread across boroughs and neighbourhoods spanning the whole region of Greater London. Each area has its own unique feel and Stratford is a bustling district you may have heard of for its heavy involvement and being the home of the London 2012 Olympics. 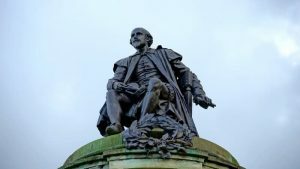 We have lots of homestay accommodation options in Stratford and the surrounding areas, so read on to learn more about it and decide whether it’ll make the right base for your capital city stay. Sitting within the London Borough of Newham, Stratford is in East London and covers the E15 and E20 postcode districts. It’s quite a large neighbourhood and spans both green space, commercial units and residential areas. Leyton can be found just to the north, Forest Gate and West Ham to the east, Poplar and Bow to the south and South Hackney to the west. What’s the typical accommodation type in Stratford? A traditional East End working-class neighbourhood, Stratford has benefited greatly from the regeneration and investment spent as a result of the London 2012 Olympics. 20,000 new homes were built as part of this project and development is still ongoing. You’ll find, therefore, that lots of the accommodation in this area is new-build, spanning both impressive and colourful blocks and flats and townhouses. However, there’s also areas of this neighbourhood that haven’t been gentrified or re-built, with the typical London Victorian terraced houses along tree-lined streets. Stratford’s regeneration and commercial investment makes it quite a tourist attraction, so its rare that you’d find a deserted street here; even overnight. The amount of people walking around determine that the area is mainly safe and it’s unlikely you’d encounter any trouble unless you look for it. You may see homeless people around the more commercial areas, but the homeless community here is relatively harmless and will be happy to chat if you’re not handing over any change. What type of people live in Stratford? Stratford’s proximity to central London as well as its numerous local amenities attracts a whole range of people who reside here. There’s plenty of schools and university facilities, so you’ll find families and students; as well as professionals and couples who either commute into the city centre or work in the nearby area. The population of Stratford is a fantastic mix of backgrounds, cultures and religions and you’ll always find someone interesting to talk to. You’ll hear languages from all over the world throughout the neighbourhood and find lots of expat communities here. What transport links does Stratford offer? Stratford is not far out of central London and so the transport links here around the city are excellent. It’s a significant transport hub, and you’ll find connections in and out of London. There’s seven rail stations in the area, spanning the mainline railway, London Underground, Docklands Light Railway, HS1 international line, London Overground and TfL Rail. It will also link to the Elizabeth Line from late 2018. Stratford Bus Station is served by numerous routes around the capital and many nationwide National Express coach services stop in Stratford on their way into London. There’s a Santander Cycles docking station at Stratford Station and private transport such as minicabs and Uber serve the area well, too. Stratford makes for an easy driving route into East London and is not covered by the Congestion Charging Zone but does have busy roads. What is there to do in Stratford? Since pre-2012 development took hold of the area, there’s more to do in Stratford than ever… you may never need to leave! The main Olympic Park of the 2012 London event is entirely in Stratford, and the facilities are all still used today. You can watch (and try!) a variety of sports spanning cycling, swimming and athletics here. 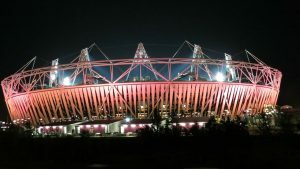 The Olympic Stadium is now home to West Ham FC and also hosts lots of non-sporting events and gigs. Even just a walk around the Olympic Park is pleasant on a nice day and you’ll leave feeling inspired by sport. Sitting adjacent to the Olympic Park, the Westfield shopping centre is home to over 250 shops and 3 flagship stores; Marks & Spencer, John Lewis and Waitrose. There’s also loads of pop-up retailers and events happening in the centre year-round, so you’ll never be short of something to do or see here. The ArcelorMittal Orbit structure can be seen from all around, but few realise its actually a working slide! Britain’s largest piece of public art can be ridden down once you’ve looked out from the viewing platforms at the top… and climbed the 455 stairs up (lifts are available). If you are an international student, intern or professional looking for homestay (“host family”) accommodation in Stratford or close by, we would love to hear from you. Similarly, if you have a spare room in your Stratford home and are interested in hosting overseas students, please do get in touch.